'Fashion Diva' (Thomas Johnson, R. 2009). Seedling# TX35A. TB, 38" (97 cm), Early to midseason bloom. Standards rich dusty rose; style arms salmon buff; Falls velvety dark rose-wine, medium rose bands, short white lines on either side of orange beard; musky fragrance. 'Louisa's Song' X seedling# TU22A: ('Confidante' x 'Crazy For You'). Mid-America 2009. Honorable Mention 2011. 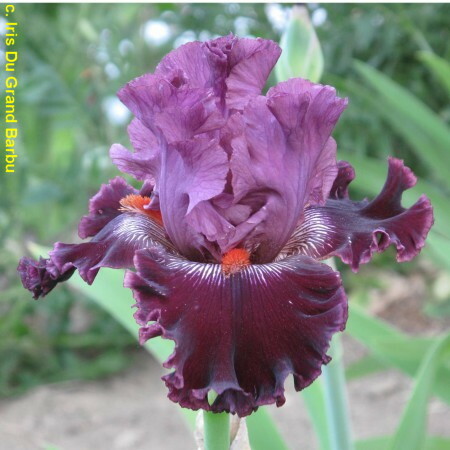 From Mid-America Garden catalog, 2009: FASHION DIVA (T.Johnson 09) TB Early-Midseason 38” (97cm). She's bigger than life, all decked out in the latest haute couture. She's Fashion Diva! Rich, mid dusky rose standards are heavily ruffled and tightly swirled. Expansive falls with overlapping hafts are velvety, dark rose wine and adorned with heavily ruffled mid rose bands. Show-off orange beards are accented by short white veins on each side. Huge flowers are indeed a sight to behold. Husky, vigorous growth produces stalks with 2 branches and about 7 buds. Sdlg. TX35A: Louisa’s Song X (Confidante x Crazy For You). $60.00.